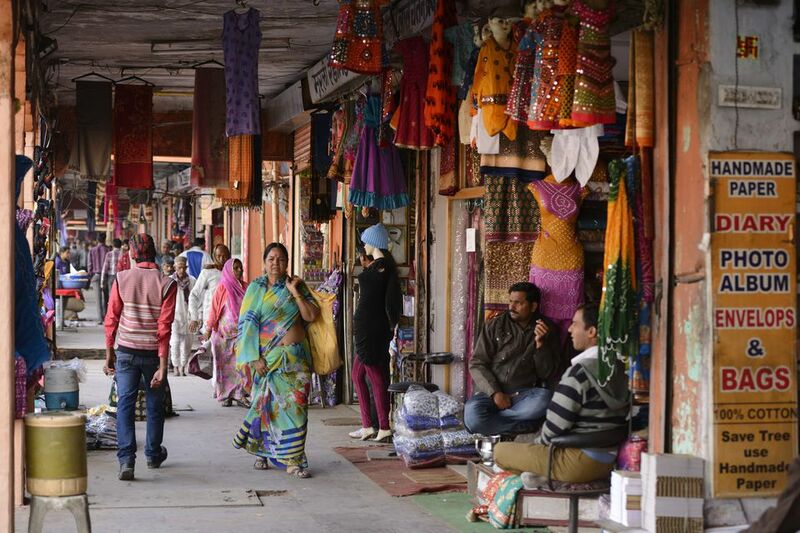 Markets, Malls, Handicrafts, Tea, Saris and More! It's hard to resist shopping in India (particularly if you're female)! There are so many beautiful handicrafts and so much variety. Prices are inexpensive too. Where to find the best shopping really depends on what you want to buy. Each region in India tens to specialize in a particular industry that's been handed down over generations. It's a good idea to shop in the states where the goods are made and prices are cheaper, although you'll find emporiums stocking goods from other states all over India. These emporiums are targeted at tourists, so prices are generally fixed and higher than you'd otherwise pay. Take a look at this Guide Shopping by Region in India to get an idea of what's available and where. Arguably, the best markets in India can be found in Delhi. You name it and you can get it! This includes everything from cheap souvenirs to precious antiques. Mumbai also has a few renowned markets where you can pick up a bargain, although it really doesn't compare to Delhi! The quirky 150 year old Chor Bazaar is a favorite! Here are the Top 5 Markets in Mumbai. In Kolkata, don't miss checking out massive New Market, one of the Top 5 Places to Shop in Kolkata. In Jaipur, Johari Bazaar in the Old City is famous for jewelry (particularly in Gopalji ka Rasta and Haldion ka Rasta lanes). In Chennai, T Nagar's Pondy Bazaar has an endless array of gold and textiles (and there are plentiful tailors nearby who'll create whatever you want out of the cloth you purchase).It's the biggest shopping neighborhood by revenue in the country. If you're in Goa, the huge Wednesday flea market at Anjuna beach is an experience. There's also a Saturday Night Market in Apora in north Goa. Haggling is a must at markets in India! If you're not experienced in this, here are some tips to get the best price. One of the best things about shopping for handicrafts in India is that often possible to meet the craftsmen and watch them at work. Jaipur is known for its block printing and blue pottery. See these 5 Shops You Shouldn't Miss in Jaipur. In Odisha, there are two handicraft villages (Raghurajpur and Pipli) that you can visit where the residents are all artisans, engaged in their professions. Odisha is also known for its unique silver toe rings. You'll find specialty silver shops filled with them around the railway station in Bhubaneshwar (which is also worth visiting for its temples) -- and they're surprisingly inexpensive! The Kutch region of Gujarat is renowned for its handicrafts, produced by the very talented artisans in its villages. Many of the famous arts, such as bandhani tie die and ajrakh block printing, originate from Pakistan. In addition, arts such as embroidery, weaving, pottery, lacquer work, leather work, mud and mirror work, and rogan art (a type of painting on fabric) are prevalent in the region. In late December every year, Shilpgram rural arts and crafts complex near Udaipur comes alive with a 10 day Shilpgram Arts & Crafts Fair. There are some handicraft stalls there during the rest of the year, although it tends to be sadly rather lackluster inn the low season. Non-Government Organizations (NGOs) that provide employment for underprivileged people in India are another great source of handicrafts, and your money will be going to a good cause! Try MESH in Delhi (which sells handicrafts produced by disabled artisans) and Sambhali Boutique in Jodhpur (which sells handicrafts and clothes produced by underprivileged women). If you're really into handicrafts, take one of these 10 Themed India Tours to Learn About Indian Handicrafts. The tours range from short half day tours to extensive tours of a week or more. If you're after gemstones, head to Jaipur (but be careful of the well known gemstone scams there). Make sure you read this guide about how to buy gemstones in India first! Mall mania has hit Mumbai in recent years, with new malls popping up all over the city. Most malls are more than just shopping destinations. They've got huge food, gaming, and entertainment zones as well, offering fun for the whole family. For designer brands, go to the new high-end Palladium Mall at High Street Phoenix. See these 5 Biggest and Best Mumbai Malls. These 8 Tantalizing India Tea Shops and Bars are among the best places to sample (and buy) tea in India. If you're heading as far as Gangtok in Sikkim, don't miss the Golden Tips tea showroom (Punam Building, First Floor, MG Marg), which is sought after for its boutique teas including temi tea that's grown in Sikkim's only tea garden. Every state across India has its own special weaves and fabrics for its saris. One of the most popular and traditional types of saris is the Kanjeevaram (Kanchipuram), from south India. Another popular type of sari is the Banarasi sari, which is hand woven in Banaras (also known as Varanasi). Other well known types of saris include the bright tie-dyed Bandhani/Bandhej saris from Rajasthan and Gujarat, cotton Gadhwal saris with silk borders and pallu from Andhra Pradesh, Maheshwari saris from Madhya Pradesh, and the gorgeous fine silk and gold woven Paithani saris with peacock design from Maharashtra.